March is Women’s History Month, and as the national celebration approaches its 40th anniversary, we’re proud to see the Maryland Daily Record recognize 100 influential women for their achievements and leadership in the state. The Top 100 Women were selected from more than 500 nominations and two rounds of judging, and were based on outstanding achievements in careers, community leadership, and mentoring. One name we are particularly proud to see on this year’s list is Maryland Commerce Secretary Kelly Schulz. Secretary Schulz joined Maryland Commerce this year after leading the Maryland Department of Labor, Licensing, and Regulation and its nearly 2,000 employees since 2015. While under Schulz’s leadership, the agency’s Employment Advancement Right Now (EARN) program was named one of the top programs in the Innovations in American Government Awards. Additionally, Schulz helped the state’s apprenticeship program grow to more than 10,000 apprentices—the highest total since 2008. Previously, she served in the Maryland House of Delegates and held several roles in the private sector, including a part-ownership of a local cybersecurity firm. 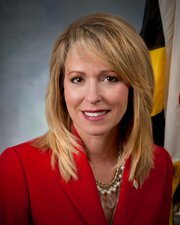 Also named to this year’s Top 100 Women is Secretary Carol Beatty of the Maryland Department of Disabilities. Secretary Beatty is receiving the award for the third time and will be inducted into the Daily Record’s Circle of Excellence with four other three-time winners. Several others in public service were also named to the Daily Record’s honorees, including women from the Maryland Department of Legislative Services, Maryland Department of Juvenile Services, Maryland Insurance Administration, Maryland Environmental Service, Comptroller of Maryland, as well as the Maryland State Senate and the House of Delegates. Since 1996, the Maryland Daily Record has awarded more than 1,600 Top 100 Women. The winners will be celebrated on April 15 at the Joseph Meyerhoff Symphony Hall in Baltimore. Read the full list of winners online.